So you want to join the alkaline water health club, but you are wondering where to buy alkaline water and alkaline water machines? I’m your host, Hercules, the water guru who drank alkaline ionized water until it came out my gills. Like any health product, especially water health products, it’s important to do some research before you buy. Everyone can remember how the savvy rapper 50 Cent made a ton of money selling Vitamin Water. Well, alkaline ionized water is actually healthy, unlike artificially flavored Vitamin Water. Although, it’s important to know where to buy it. How do alkaline water bottles work? 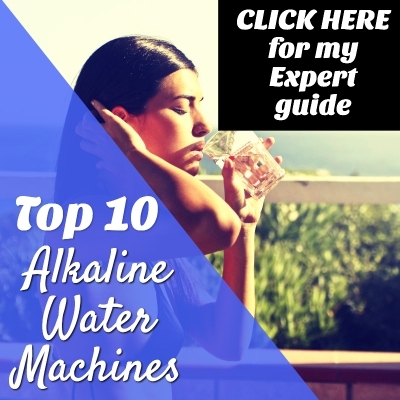 If this is your first visit to Alkaline Water Machine Source, you can check out the article I previously wrote about buying alkaline water in bulk. The problem with buying alkaline ionized water in bulk is that the healing power of the water degrades quickly once the water has been ionized. The reason alkaline ionized water is so beneficial to human health is mainly due to the antioxidants in the water after it’s been alkalized and ionized. Once fresh alkaline ionized water sits in a plastic bottle, it loses its charge that supercharges our health. Plus, who knows how long it will sit in a plastic bottle before it reaches your lips? On top of that, you are creating more plastic waste and drinking out of plastic containers that could contain harmful chemicals. This isn’t tin hat kind of stuff either. The best way to drink your water is from an insulated stainless bottle or a borosilicate glass. Yes, you can choose to drink out of BPA-free plastic bottle, but that should be your last choice. Check out this National Geographic article to see how big an impact plastic waste is having on the world. By investing in an alkaline water machine and a glass or stainless steel bottle, you instantly cut back on a ton of plastic waste. Just imagine how much plastic waste one person creates every year. The bottom line is that when you see alkaline water being sold in plastic bottles or other sites recommending you buy alkaline water in plastic bottles, you should think twice. I began drinking alkaline water while living in Southeast Asia. I’ll be the first to admit that I did buy it in plastic bottles, but it was my only option. Alkaline ionized water was one of the main ingredients in my healing journey after suffering from chronic fatigue for over a decade. Nowadays, I drink multiple big glasses of alkaline water right when I wake up before my green tea, and I feel like a million bucks. The main point is that buying bottled alkaline water should be your last choice. The best place to get alkaline water is in your own home. Whether you are single or have a family to take care of, you will save money by making alkaline ionized water in your own home instead of buying it by the bottle. In reality, buying it by the bottle defeats the whole purpose, but it will get the job done if you’re in a pinch. If I’m traveling and my only options are bottled water brands, I’m going to buy the alkaline water brand every time. There are several options for making alkaline water at home. Believe it or not, lemon water has an alkalizing effect on the body, despite the acidity in a lemon. Keep an eye out for my upcoming guide on how to make alkaline water at home with lemons. The problem is that while the lemon will help you alkalize, it’s not going to ionize the water. The best way to make alkaline antioxidant water is with an alkaline water machine. The beauty of owning an alkaline water machine is that you have a 24/7 supply of amazingly healthy water for you and your family. You’ll never have to worry about the quality of your water again or buy bottled water in the grocery store. For those people who have water delivered, you can cut that out as well. One of the top pages on my site is my complete top 10 water ionizer guide that you can check out by clicking here. I did all the heavy research for you and created a list of 10 ionizers sold by the best alkaline water brands that stand behind their products 100%. Most of the ionizers come with a lifetime warranty and a handful with a money-back guarantee, which means you can essentially try before you buy. On my Top 10 page, you will find tables that make sorting all the features a breeze and all the current lowest prices for each ionizer. If you are new alkaline water and want to get the most bang for your buck, I recommend the Aqua Deluxe 5.0 ionizer. It comes with all the features you need without all the bells and whistles and the hefty price tag. Plus, you get a lifetime warranty. Keep in mind that you don’t have to spend thousands of dollars to get a quality alkaline water machine. A lot of owners of the units I recommend on my site report getting the same quality of water as the more expensive Kangen ionizers. So to answer the original question in one sentence. The best place to buy an alkaline water machine is online. Don’t waste your money and create more waste by buying bottles of alkaline water in bulk. One, you won’t get the same health benefits, and two, you’re throwing money down the drain in the long run. Think of it this way, would you rather pay rent or own a home? If you’re not planning on going anywhere, owning a home is almost always the better option. Personally, I’d rather boost my equity than toss money into an abyss every month. This same principle applies to buying alkaline water. Why buy bottled alkaline water when you can own a machine that will pay for itself? There are also other options if you’re not quite ready to buy a new alkaline water machine. Alkaline water technology has come a long way over the past several years as people are waking up to realize that harmful acidity in the body can cause a myriad of health issues. I know I for one love the fact that I’m not getting heartburn anymore. It wasn’t hard to connect the dots. After I started drinking alkaline water, my heartburn went away. The most affordable alternative to buying a water ionizer is an alkaline water bottle. If you use an alkaline water bottle, it’s best to filter the water before it goes into the bottle. Alkaline water bottles use cartridges that contain alkaline minerals to boost the pH in the water. They also do a decent job of lowering the ORP, which means more antioxidants in each glass. If you want to read more about ORP click here. To quickly summarize, the lower the ORP value of the water the more antioixdant potential in the water. Premium alkaline water machines produce ORP values of -800mV (millivolts) or lower. This alkaline water bottle made by DYLN advertises an ORP of up to -150mV and a pH of up to 9.0. I think alkaline water bottles are a decent solution but definitely not the best option. The reviews are all mixed on these products. I remember years and years ago I bought a similar product and wasn’t very impressed. 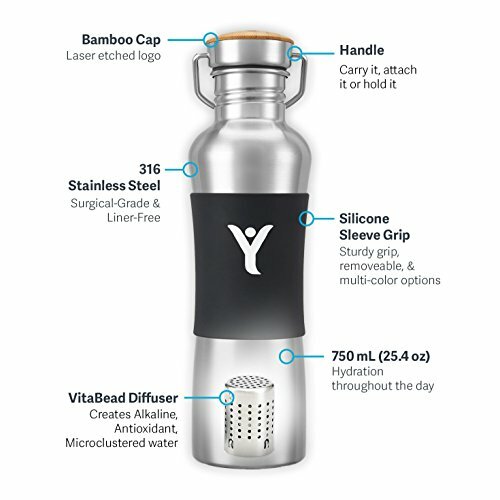 Some people say they love the DYLN bottle while others complained that it sweats and doesn’t keep water cold. That’s why I recommend getting a YETI rambler and a quality water machine. My buddy introduced me to YETI cups a few years ago, and I was instantly sold. He used his for everything. He would ask smoothie shops in the Bay Area to put his smoothies in the YETI cup, and I’d see him drinking the smoothie hours later. It’s amazing how well they keep liquids hot or cold. There are also alkaline water pitchers, which I like more than alkaline water bottles. For one, I can use the pitcher to fill up my own bottle. Second, the pitcher will also filter the water. 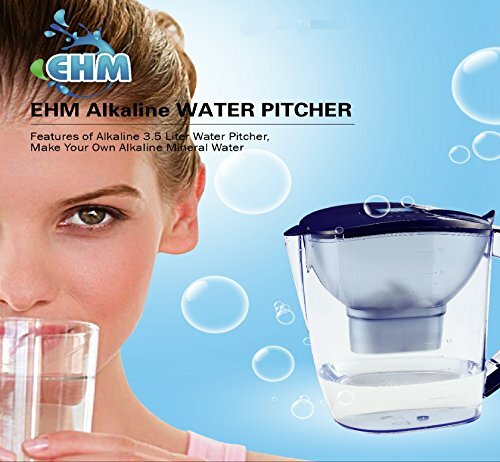 You can click here to check out one of the best alkaline water pitchers. Another pro is that the pitchers cost less than or around the same as the alkaline water bottles. They also have hundreds more positive verified 5-star reviews than the bottles. 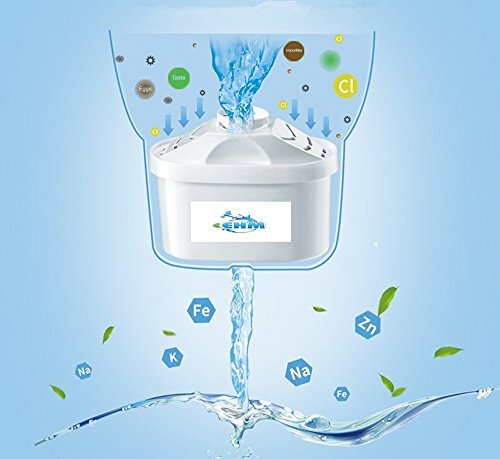 The alkaline water pitcher in that link uses a 6-stage filter to remove chlorine, heavy metals, and other contaminants before adding alkaline minerals to the filtered water. Alkalizing minerals including calcium, magnesium, and potassium are all added. The resulting ORP of the water is -100 to -200mV. Not bad. It also produces a pH of 8.5-9.5 which is good. Although I wouldn’t recommend starting out drinking water with a pH of 9.5. That’s too high until you’ve been drinking alkaline water for at least a few weeks. That’s another reason alkaline water machines are such a luxury. You can choose the exact pH of your water with an ionizer. A cool feature to note on the alkaline water pitcher is that it has a special screen that blocks those black particles from entering your water. Most of us have probably seen those black specs in Brita water. Each cartridge in the alkaline water filter pitcher lasts for up to 80 gallons. A 3-pack of replacement filters costs a little under $30. Next up, there are now reverse osmosis water systems with pH boost. When water gets filtered through a reverse osmosis water system, it’s stripped of all its minerals. The result is a slightly acidic water with a pH between 5.0 and 6.0. This reverse osmosis system that you can check out by clicking here adds minerals to the water to boost pH after it’s been filtered. In my opinion, this is the next best thing after an alkaline water machine. Owners of the system are reporting a great tasting water, and the 5-star reviews are currently at 88% for this system with only 2% negative reviews. These guys definitely know what they’re doing. There is also a countertop alkaline water filter option that is affordable and has hundreds of positive reviews. What I like about this unit is that it’s made in the USA and is super easy to install. I would rank this as your third best option after the alkaline water machine and the reverse osmosis alkaline system. It works the same as the alkaline water pitcher but does a better job. First, the water gets filtered before alkaline minerals are added into the water to raise the pH. One use reported a consistent pH of 8.0 using the APEX Countertop Drinking Water Filter. That’s a good pH and certainly better than what you’ll get from most bottled water, but it still doesn’t give you all the options that an alkaline water machine gives you. Regardless, it’s a huge step up from typical water filter pitchers that have been shown to make water more acidic. A PUR water filter pH level surely won’t be as high as what you get with the alkaline water products I’ve mentioned in this article. The gentleman in the video below tests the pH level of Brita filtered water. The moral of the story is for all these years Americans have been duped into drinking water from a filter that makes slightly acidic water. Now you should know exactly where to buy alkaline water and all the options you have to upgrade your current water situation. I like to always remind people that our bodies are made of mostly water. It doesn’t take rocket science to figure that out. People around the world are drinking alkaline water as part of their healing regimens or just to feel better overall. Once you start drinking alkaline water, start slowly. Water with too high of a pH can be just as bad for you as acidic water. It’s important to start with pH 8.0 and work your way up to pH 9.5 water maximum. You can click here to read my list of top 25 alkaline water benefits to see all the ways that alkaline water can benefit your health. People are drinking alkaline ionized water to lose weight, and diabetes sufferers are even drinking it because of its positive effect on the kidneys. This article explains how chronic metabolic acidosis wreaks havoc on the kidneys and makes kidney disease worse. But before I go too far off the rails, I wish you the best of luck with your health and hope my article helped guide you in the right direction! If you know of any good alkaline water options I left out, please let me know in the comments section below. Money doesn’t mean anything to me. I’ve made a lot of money, but I want to enjoy life and not stress myself building my bank account. I give lots away and live simply, mostly out of a suitcase in hotels. We all know that good health is much more important.